Luis Suarez (31′, pen. 39′), with his brace, along with Gaston Pereiro (58′) and Jose Maria Gimenez (21′) contributed the goals to La Celeste‘s first win of the new cycle. Despite a protagonistic display for phases of the game, El Tri had to make do with a Raul Jimenez penalty (24′) as their only contribution to the score. Given that both teams were in preparation mode for the rest of 2018, El Tri and La Celeste felt a freedom to go after each other in the early stages with chances at both ends. And El Tri quickly found that using a change of pace, driving (dribbling) strategy in the attacking area had its rewards as they forced Uruguay goalkeeper Fernando Muslera to make two saves in quick succession,the second of which came from a sharp angle effort off the boot of Hirving Lozano who was left completely unmarked inside the area. But twenty-one minutes in, set piece defending, a concern of El Tri in past cycles, presented as the area in which their clean sheet was broken as Jose Maria Gimenez headed a corner kick delivery by Jonathan Urretaviscaya beyond Guillermo Ochoa’s far post. 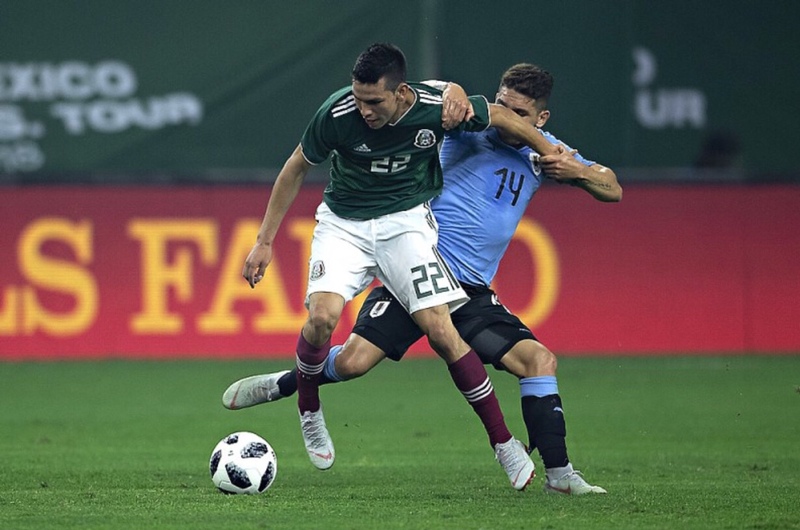 Three minutes later, after some persistent pressure by Uruguay, El Tri got their chance to equalize when Rodrigo Bentancur tackled Hirving Lozano late inside the area to concede a penalty. Raul Jimenez converted the penalty with a rising shot to bring El Tri back on level terms at 1-1. El Tri‘s hopes of trying to turn the newly found momentum into an advantage faded within eight minutes when, after a foul by debutante Jesus Angulo just outside the area, Luis Suarez curled a free kick directly beyond Guillermo Ochoa to restoleste‘s advantage. The goal by Luis Suarez seemed to embolden La Celeste as they forced Guillermo Ochoa into action twice once again to keep El Tri‘s deficit at 2-1, saving shots by Urretaviscaya and Matias Vecino, the second of which came on a quick interception due to a miscontrol and transition. Eight minutes after Luis Suarez’s first goal, Angulo fouls ‘El Pistolero‘ (Suarez) inside the area to concede the penalty. The next minute, Suarez converted with a chip to stretch the Uruguay lead to 3-1. At the start of the second half, ‘Tuca’ Ferretti’s introduction of Cruz Azul winger Roberto Alvarado seemed to provide more teeth to the Mexico attack and their ability to sustain possession, though La Celeste were more than happy to concede that possession given therr demonstrated technical and tactical superiority at that point in the match. And Hirving Lozano, the driver of Mexico’s attacking chances in the first half, continued to make chances for El Tri to get back in the game when he dribbled through several Uruguay defenders to fire a shot on Uruguay’s goal, only for it to be straight at the Galatasaray arquero (Fernando Muslera). El Tri continued to build up their passing streaks as the half progressed, but the possession worked against them when, in the 58th minute, off a 5-vs-3 buildup that caught El Tri‘s defenders out of good marking position, Gaston Pereiro finished a switch of play orchestrated by Jonathan Urretaviscaya and Luis Suarez just inside the area to extend the Uruguay lead to 4-1. Fifteen minutes after Pereiro’s goal, El Tri gained their best chance to cut their deficit to Uruguay when Martin Caceres made a late tackle on Raul Jimenez inside the area to concede a penalty for El Tri. But Raul Jimenez, who appeared to be the designated penalty taker for the match for El Tri, directed the penalty into Muslera’s control. El Tri continued to try to generate chances from the run of play, but often found themselves missing the final cross or pass to trouble Muslera as the match wore on. The defeat marked El Tri‘s second three goal defeat in its last three, all of which El Tri have lost. But El Tri still have at least four international windows of games to play. El Tri will look to its game against the United States on Tuesday, September 11 in Nashville to convince fans to stick to the team’s preparatory strategies. But against the Stars and Stripes, El Tri will not have the services of Hirving Lozano, who, according to his father withdrew from this selection after the match in order to retain match fitness ahead of PSV’s league fixtures and UEFA Champions League tilt with FC Barcelona. As for Uruguay, interim manager Fabian Coito spoke highly of Uruguay’s footballing level against Mexico and praised the work and approach to balance and attacking and defending spaces that battling El Tri provided his La Celeste in a press conference documented for Ovacion. Whether or not Coito does get the job, the match against El Tri was the only match Coito (and Uruguay) had this window. La Celeste‘s next match will take place on October 16 in Saitama, where they will take on Japan in another friendly.